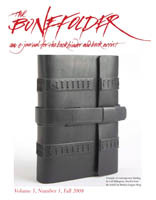 For the 2008 Bind-O-Rama, submissions were accepted for books made using any of the binding styles previously featured in The Bonefolder. So quite a mixture, including: the springback binding, drum leaf binding, the tunnel book, the millimeter binding, the flag book, the limp vellum binding, a twined binding, and some others. You can download the PDF to see all the books, including a springback binding that I made. I've always enjoyed the books you post about. I'm trying to gear my blog towards papercrafting and the like, once I get into the swing of it all. Mind if I link to your blog? thanks! sure, i don't mind if you have a link.